One of my two yearly conferences was last week and this weekend, and I'm still recovering. This year my program was hosting, which was quite a change from last year when it was at the University of Groningen in The Netherlands. In addition to trying to go to the scientific part of the conference and social events, I was also running around trying to organize a workshop and help out with odds and ends. I was so tired today that I dozed off in my office and almost fell out of my desk chair. Needless to say, I haven't felt like putting a whole lot of energy into cooking for the last couple of days. Boil or steam broccoli until it's tender, drain (if boiled), and set aside. While broccoli is cooking, cook bacon in a small skillet until it gets crispy and set that aside. Cook the pasta according to package directions. When the pasta is almost done, beat egg and parmesan together. Drain the pasta, immediately put it back in the pot, and stir in egg and parmesan. 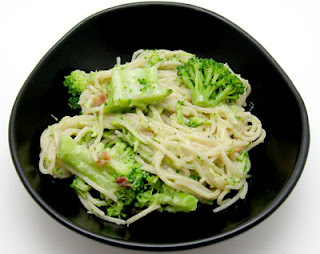 Once the pasta is well mixed, add in bacon and broccoli and season with pepper. Serves 3. Delicious! This is definitely comfort food at its finest, but the broccoli (from my CSA share!) provided a nice texture contrast and also made it a tad bit healthier. There was just enough bacon to give it a great flavor. The best part? this was ready in 30 min (and it would have been even faster had I not been moving at a snail's pace). Well, it's officially the end of the month, and time to wrap up this month's cookbook of the month, "How to Cook Everything" by Mark Bittman. I'm still in love with this book because it has many classic recipes and encourages improvisation with a variety of add-in ideas for just about every recipe. I had a good time trying out classic chicken dishes (coq au vin and chicken adobo), making pasta for the first time (mixed greens ravioli), experimenting with new ways to cook turnips (braised turnips with mustard sauce), finally using my quiche dish (onion quiche with brown rice crust), and joining fruit and couscous (whole wheat couscous with apricots and pistachios). My favorite recipes that I made from the book this month, though, were shrimp and sausage jambalaya, potato pizza, and this carbonara recipe. I should also note that I've made many things from the book in the past: white bean dip, vegetable dip, cooked onions and apples, asparagus topped with mushrooms, and miso soup. Phew! That's a lot of recipes, and I can truly say that I've gotten to know this book. As you can see, it has all of the basic recipes that you could ever need. But, there are so many variations for each main recipe, that I could probably spend several years cooking something new from it every day. The title says it all, folks. I frequently use the black, kidney, and pinto beans that I've cooked and stored in the freezer, but it's been a while since I grabbed a bag of chickpeas. 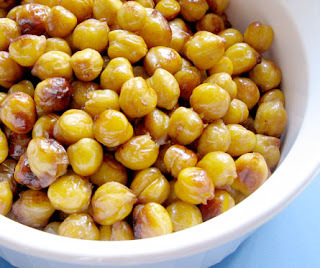 It's always good to have a high protein snack around, so I decided to try out a recipe for roasted chickpeas that I saw on Could It Be... SEITAN?. Combine the ingredients in a small bowl, spread the chickpeas out on a baking sheet, and roast at 400 for 20 min. Then stir the chickpeas and continue to cook for another 10 min. Serves 3. These are incredibly addictive, and make a great snack after a long run. The only downside is that they're not as crunchy the next day. They're still delicious (and I still ate them like candy), but from now on I'll probably only make one serving at a time or wait until I'm having people over to make the full recipe. I'm submitting this to My Legume Love Affair Twelfth Helping, which was started by Susan at The Well-Seasoned Cook and is hosted by Apu at Annarasa this month. It's wedding season, and that means endless parties (showers, bachelor/bachelorette parties, and actual weddings). Every year it seems that I have more and more weddings to attend, but I still love going. It's somewhat surprising that I would look forward to an occasion that requires dressing up (that's not my cup of tea), buying presents, and religious traditions, but somehow I always end up having a blast. Last weekend I was attending a bachelorette party in Ann Arbor. I knew that we would be hanging out at the hotel for a good part of the night, so I wanted to bring something for us to have for late-night snacks. I didn't have a whole lot of time that day, so I had to make something quick with things that I already had around. Beat eggs, butter, and apple juice together in a medium bowl. 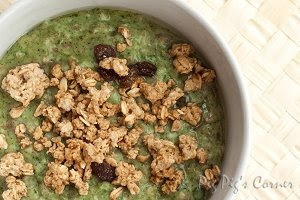 In a small bowl, combine oats, raisins, and walnuts. Beat 1 cup of oat mixture, flours, baking soda, baking powder, 1 cup of dates, cinnamon, nutmeg, and ginger into the egg mixture. Oil and flour a 9 x 13" pan, and pour batter into it. Top with remaining dates and oat mixture. Bake at 350 for 20 min, or until toothpick inserted in center comes out clean. Let cool and cut into squares. Makes 24 small squares. I enjoyed these, as did the rest of the girls. I'm still nervous making sweet things for people who aren't accustomed to my fruit-sweetened concoctions, but these seemed to go over well. One of them remarked that they had the perfect amount of sweetness that would work for a dessert or breakfast. Indeed, I had a couple for breakfast the next morning. 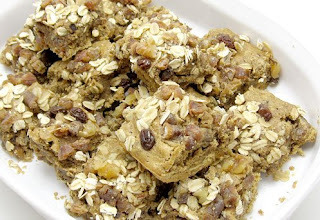 This could be varied a ton based on the dried fruits and nuts that you like and have on hand. The only thing that I would suggest is to press down the toppings into the batter slightly so that they don't fall off as you're eating them. By now, you've probably noticed that I'm in love with my CSA, Titus Farms. 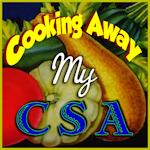 I was so excited about cooking with my CSA goodies this summer that I joined Cooking Away My CSA, a group started by Heather from Flour Girl. It's been a ton of fun to share recipes and hear about what other people are receiving in their shares. I've decided to post a round up of what I started with from each share and what they became. I got a small share and only receive it once every 2 weeks, so you'll be seeing one of these posts every couple of weeks. and a strawberry and kale smoothie (using some of my kale, as well). 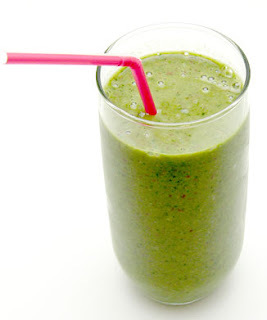 I basically blended about a cup of frozen strawberries, several handfuls of torn kale, 1/2 cup plain yogurt, 2 Tbsp flax meal, a spoonful of pineapple juice concentrate, and enough water to get it to the right consistency. It was really good, and I couldn't taste the kale at all. I used the mixed greens (along with the turnip greens) to stuff ravioli, and the green garlic went into a pesto. 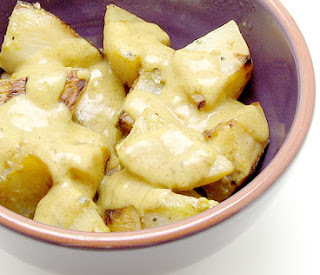 I decided to braise the Japanese turnips and then made a mustard sauce for them. And finally, the bok choy (along with one stalk of green garlic) was braised and topped with salmon. All in all, I think I did a fairly good job of making a diverse set of meals with my goods. Everything turned out great, and I can't wait to pick up my next box on Monday! I recently conquered my bread baking fears, so I needed a new challenge. I had never made pasta, and it was time to remedy this problem. I wasn't going to let the fact that I don't own a pasta machine get in my way. But now what kind of pasta should I make? Well, I had a bunch of mixed greens (kale, chard, collards, and the ones off of my turnips) from my CSA share this week that I thought would go nicely with whole wheat pasta. I could have sauteed these and added them to fettuccine, but I decided to step it up a notch and make ravioli with a mixed greens filling. And to top it off, I added a green garlic pesto because, again, I had a ton of green garlic from my CSA and what would be better? Cook greens in boiling water until they wilt (1-2 min), and then drain them and let cool. Heat the olive oil over medium heat in a medium skillet. Add garlic and cook for a minute. Chop greens and add them to garlic, then remove this mixture from the heat and let cool. Stir in egg, parmesan, and seasonings. Set aside while you prepare the pasta. Add flour and salt to the bowl of a food processor and pulse several times. Then add eggs and let the processor run until the dough forms a ball (30-60 sec). If your ball of dough is very dry, add water by the tablespoon and blend briefly. If the dough sticks to the sides of the processor, which is not likely, add a tablespoon of flour. Lightly flour your counter, and knead the dough on the counter for several minutes, until dough is smooth (you can still make adjustments if needed). Cut the dough into 6 pieces and put 5 under plastic wrap. Roll out the remaining piece of dough with a rolling pin as thin as possible into a rectangle (or use a pasta machine). Put small heaps of filling (about 1/2 Tbsp) along one of the long sides of the rectangle. Wet the dough around the filling with a pastry brush or paper towel, and fold the other long side onto the filling side. Press down firmly around filling, and cut ravioli apart with a sharp knife. Repeat with the other 5 pieces of dough. Cook ravioli in salted boiling water until they completely float to the top (about 5 min). 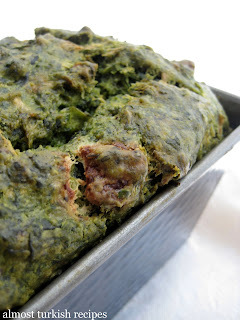 Top with green garlic pesto or your favorite sauce (or simply butter). 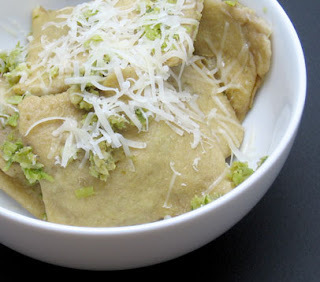 Makes about 28 ravioli (they're extremely filling, so this made about 5 meals for me). 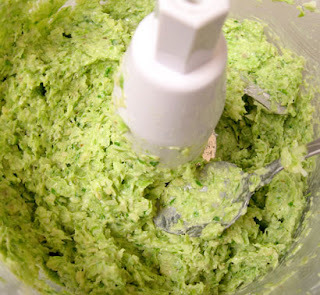 Add green garlic, walnuts, parmesan, and salt and pepper to the bowl of a food processor. Process until everything is minced. Stir together water and oil, and slowly pour this into the processor chute while the machine is on. Stop when it's at your preferred consistency (I like mine on the thick and chunky side, so I only added about 2/3 of the mixture). Store in the refrigerator or freezer with a layer of oil on top. Makes about 2 cups. This is exactly why I love the summer. I can take whatever I get from my CSA or the farmers' market and let my creative side take control. When you start with quality ingredients, it almost always works. The pasta was delicious, and I will definitely be making it again. I didn't get it extremely thin, but it was still amazing. I also really enjoyed the greens filling. 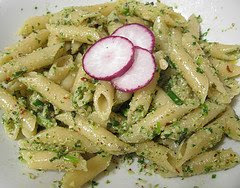 The pesto was good, too, although I used this sparingly because I wanted to be able to taste the pasta and the filling. I can't wait to try some on a sandwich this week. I'm submitting this to Weekend Herb Blogging, a blogging event organized by Haalo from Cook (almost) Anything At Least Once and hosted by Astrid from Paulchen's Foodblog this week. After making the gelatin recipe (see below for that one), I decided to have a strawberry pudding showdown. My two main cookbooks for fruit-sweetened desserts each had a recipe, and they were very different. The solution? Try both. 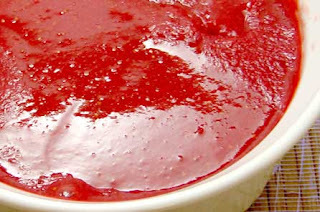 Beat the strawberry puree, egg whites, and juice concentrates together, and set this mixture aside. Beat milk, arrowroot, and powdered milk together and pour into the top of a double boiler (or a metal bowl that fits inside a saucepan) with boiling water. 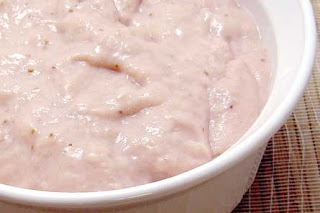 Cook the mixture, stirring frequently, until it thickens, and then remove from heat and add a few Tbsp of the milk mixture to the strawberry mixture. Then put the double boiler back on the heat and gradually beat the strawberry blend into the egg mixture. Continuously beat this, while still cooking, for 10 min. Stir in vanilla extract, remove from heat, and chill. Serves 2-3. This one was decent. It had a good taste, even though it was somewhat subtle and the orange juice taste covered up the strawberries a bit. I would leave the OJ concentrate out if I made it again. The consistency was off, too. It was right when it was done cooking, but by the time it sat in the refrigerator for a few hours, it became almost like glue. That doesn't sound appetizing at all, but I promise that it was still good. 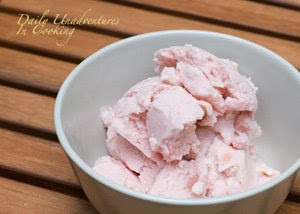 Blend the strawberries and arrowroot together and pour into a double boiler over boiling water. Cook until it thickens, stirring constantly (8-10 min). Then remove from heat and chill. Serves 2-3. This one was also good, but still not perfect. I think that I preferred the flavor of this one over #1 because it was pure strawberry. But, the texture was way off. Even though it thickened after boiling, it never really got thick enough to be pudding consistency. After I would take a few bites, the remaining "pudding" would slowly slide over to cover the empty part of the bowl. Pudding isn't supposed to do this. I still ate this up rather quickly and had no regrets about making it. I guess that next time I should combine the two recipes somehow to get the right consistency. Stir the gelatin into the cold water, and let sit for 3 min. Then add juice and boiling water, stir until gelatin dissolves, and add strawberries. Chill until it sets (I really have no idea how long it took, but I'm guessing several hours). Serves 6. 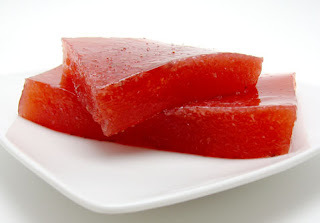 As a former lover of Jello, I'm appalled that this was my first homemade gelatin experience. It doesn't get much easier, and there's no better summer dessert (particularly when strawberries are involved). I LOVE this. The taste is unparalleled - so fresh and delicious. It's so much better than the stuff with the artificial flavoring and coloring (although it's practically the same color as strawberry Jello). My favorite part is that the strawberry seeds give it a fun texture and remind you that you're eating real food. Needless to say, as soon as I had enjoyed my last bowl of pudding, I quickly made another batch of gelatin. And I'll probably end up making another this week. And perhaps the week after. And I should probably freeze some strawberries so that this can continue for a while, because I don't see myself getting tired of it anytime soon. But here's my question: I'm almost out of gelatin, and I'm thinking about trying agar-agar (a seaweed-based gelatin substitute). Anybody used it? If so, do you have any tips? I think I should be on cabbage commercials. I can eat plate after plate of the stuff, which would be a very helpful skill if multiple takes were necessary. Oh wait, I don't think the cabbage industry can afford advertising. It's a real shame because I feel that cabbage is often overlooked. Anyway, I was excited to get bok choy in my CSA share. I rarely buy bok choy because it's so much more expensive than green or purple cabbage (unless I venture to the Asian market), but it's fun to have for a change. I tried out a recipe sent in my CSA newsletter, and then topped it with seared salmon. Separate leaves and stalks of the bok choy and chop each separately. Heat peanut oil over medium-high heat in large skillet. Then add bok choy stalks and stir-fry until tender (about 5 min). Stir in green garlic and let cook for an additional minute. Then add bok choy leaves, stock, sesame oil, soy sauce, rice vinegar, and salt and pepper. Cover, reduce heat to medium-low, and let cook until the leaves are tender (about 8 min). Then remove cover, increase heat to medium, and let simmer until remaining liquid evaporates. Stir in the sesame seeds. While bok choy is cooking, heat olive oil over medium heat in skillet. Add salmon skin-side down and brush top with soy sauce. Let it cook for about 5 min, then turn over and let cook until it becomes flaky (3-5 min). 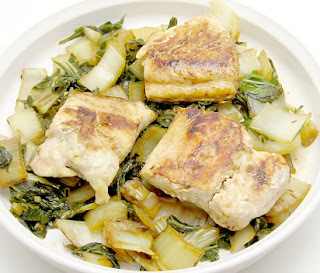 Serve salmon on top of bok choy. Serves 3. Bok choy is fun because its stalks are a bit harder than that of green cabbage. As a result, even after cooking, they stay a bit crunchy and contrast nicely with the soft leaves. I also really liked the combo of bok choy and salmon. It's been a great first week of my CSA so far, and I can't wait to see what I get next time! When I picked up my CSA share this week, one of the choices was Japanese turnips. Another lady who was picking up her share asked how to prepare them, and this prompted a long discussion. The woman who runs my CSA said that she eats them raw (which you can do with the Japanese variety), and I mentioned roasting them or mashing them with potatoes. We then bounced a few more ideas off of each other and both left with a bunch of turnips (even though before this discussion I probably would have picked the radishes or popcorn instead). Once I got home, I flipped through several cookbooks to plan a course of action. As luck would have it, this month's cookbook of the month, Mark Bittman's "How to Cook Everything," had a fabulous looking recipe. Heat olive oil over medium heat in a medium skillet. Add turnips, sprinkle with salt and pepper, and brown, stirring frequently, for about 10 min. Pour in veggie stock, cover, reduce heat to low, and let simmer for 10-15 min, until turnips are tender. Remove turnips, leaving liquid in the pan, and set aside. Stir mustard and arrowroot powder together, and then add this to the remaining liquid in the pan. Let this cook over low heat until it thickens (2-3 min), and then pour over turnips. Serves 2. I really enjoyed this dish, and the Japanese turnips were great. I think this was my first time having them, and they seem to have a milder taste than traditional turnips. I'm a huge fan of mustard, too, so I knew that I couldn't go wrong with a mustard sauce. I'm sure that this recipe would be great for traditional turnips, as well, and I'll likely be making it again once they arrive. I'm submitting this for Weekend Herb Blogging, which is organized by Haalo from Cook (almost) Anything At Least Once and is hosted by Graziana from Erbe in Cucina this week. My CSA finally started and I couldn't be happier! 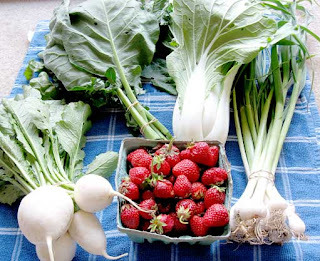 The whole concept of a CSA is that you pay up front for a share of a farm's produce for the season (but see Julia's more detailed description). In my case, I'll get stuff every other week from mid-June through October. I signed up for this smaller share because it will allow me to also buy things from other farms at the farmers' markets (which I look forward to every week). This is my first year signing up for a CSA, and I'm especially excited to get creative with the things that I get every other week. Although my CSA does give some choice in which items you get (they usually let you pick a set number of the possible items that they have that week... say 8 out of 12), I will still be getting new ingredients and finding new ways to use them. This week I came home with several things, but was most excited about the strawberries. I received an email before I picked up my share about what would likely be included, but they didn't mention strawberries because they didn't want to get everybody's hopes up in case they didn't have them in time. My eyes definitely lit up when I saw them on the table, though! I had already purchased 2 quarts at the market over the weekend, but those were almost gone after making various desserts, and besides that, one can never have enough strawberries. So, it was time to get creative. I also had some asparagus that I picked up at the market over the weekend, and decided to combine my two favorite spring crops into a dish (hey, what grows together goes together, right?). Toss the asparagus pieces with 1/2 Tbsp olive oil, salt, and pepper on a baking sheet, and roast at 400 until pieces are tender (about 10 min). Toss asparagus, spelt berries, remaining oil, vinegar, and lemon juice together, and season with salt and pepper. Top with strawberries and parmesan. Serves 4-5. I really enjoyed this, and thought that the "greenness" of the asparagus and the sweet, but slightly tart, strawberries fit well together. And the hint of sweetness from the spelt blended nicely with both of them. My favorite part was the diversity of textures, though. 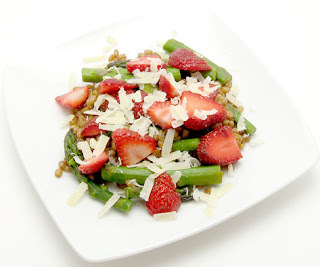 The spelt was very chewy, while the asparagus still had a nice crunch, and the strawberries melted away in my mouth. It was quite fun to eat! This was a great blend of fresh produce and whole grains, which is probably my favorite type of dish, and one of the healthiest! 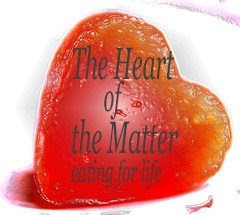 So, I'm submitting this to The Heart of the Matter, a blogging event emphasizing heart-healthy foods. 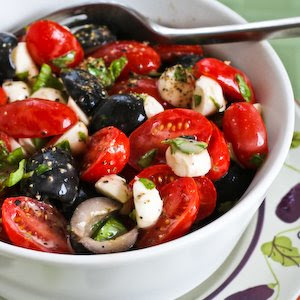 This month's theme is The Best of June's Produce, which sounds perfect for this dish. Also, be on the lookout for my recap every other week about what I did with all of my CSA ingredients as part of the Cooking Away My CSA challenge. I'm excited to try new things this summer, and I've got a few things up my sleeve for later in the week (here's hoping that they work!). I had a hard time picking the first grain to feature for my new Whole Grains 101 series. I finally decided on wheat, kamut, and spelt berries because they are some of my favorite grains that I've discovered on my whole grain adventures. Plus, I decided to make a spelt berry salad the other day that I'll be posting in the next day or so, and I figured that this would be a good time to introduce you to these. These three grains are closely related and are interchangeable, which is why I lumped them together. Before I get started, I must acknowledge that much of my knowledge about wheat kernels, as well as other whole grains, has come from Lorna Sass's "Whole Grains Every Day, Every Way." What are wheat, Kamut, and spelt berries? Wheat berries are, simply, the entire wheat kernel (including endosperm, germ, and bran). The main type of wheat berries that you find at any natural foods store (more on that later) is of the hard red variety. You may also see hard white and soft white wheat berries, and these have a slightly milder flavor (and the soft ones are obviously softer than the hard ones). I've only tried the hard red variety, but from what I've read, there's not a big difference in taste or cooking times when you're talking about the whole berry. Flours milled from these different types, however, are drastically different, and are made into whole wheat (hard red), whole white wheat (hard white), and whole wheat pastry (soft white) flours. I realized that the difference between these whole wheat flours are incredibly important, so I'll be adding a post about this at some point in the series. Although they could actually be labeled as a variety of wheat berry, Kamut and spelt retain their own name on labels. Kamut is a trademarked variety of wheat that originated in the Fertile Crescent, and these kernels are longer than those of traditional wheat. Spelt, on the other hand, is a species of wheat from Europe. Both of these have a slightly higher protein content than traditional wheat berries, and some people with a wheat intolerance have less of a problem with Kamut and spelt. What do these taste like and how are they used? All of these berries have a sweet and nutty taste. Imagine the best piece of whole wheat bread you've ever eaten and smash that into a small chewy morsel. While the three taste very similar, Kamut tends to have the boldest flavor (and is my favorite! ), while spelt has the most subtle flavor. They remain very chewy after cooking (similar to brown rice that is undercooked), and I love this texture. 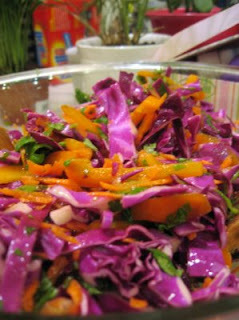 My favorite way to use them is to make them the base of a salad with veggies, fruits, and cheese. They also make great breakfasts and desserts because of their natural sweetness, and I've also tossed them in green salads or soups. 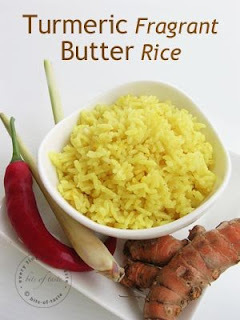 You could also use them as a rice substitute in a stir-fry or top them with a curry. Basically, I have yet to find something that doesn't work with these. Where do you buy and store them? Like all of my whole grains, I buy them at my local co-op or natural foods store. They're also available at Whole Foods, if you're lucky enough to live near one. I usually buy them out of the bulk bins because they're cheaper and I can get the exact amount that I want. If you can't find them in these places, there are many sources online. My first bag of wheat berries came from Massa Organics, and they were great (thanks, Dad!). 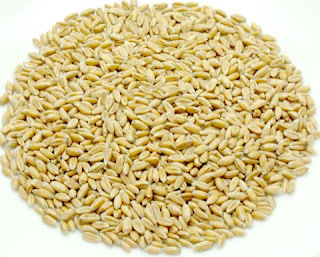 You can also order Kamut, spelt, and several varieties of wheat berries from Bob's Red Mill. If you have room in the refrigerator or freezer, store them there in an airtight container. If not, keep them at room temp but try to use them within a couple of months (but again, make sure they're in an airtight container). If you cook a big batch, they store well in the refrigerator for a week or so and in the freezer for virtually forever. There are many opinions on how to cook wheat berries, and whether you should soak them or not, but I'll give you what works for me. First, sort through them and pick out any rocks or debris, and then rinse with cold water (just as you would with dried beans). Then put them in a large pot, cover with water (several inches above the top of the berries), and bring to a boil. Once they come to a boil, reduce heat to low, cover, and let simmer for an hour. At this point they'll still be chewy, but won't be hard. Drain them, and then if there's time, return them to the pot (off of heat), cover, and let sit for 10 min. They will at least double in volume after cooking (1 cup dry = 2 cups cooked). Again, feel free to interchange these three types of wheat kernels in any of the above recipes (or any others that you discover or create). If you have a favorite recipe using wheat, Kamut, or spelt berries, leave me a comment with a link and I'll add it to the list. Or, briefly describe a recipe so that we can all share the wheat kernel love :). Is there anything else that you would like to know about these wheat kernels? Anybody going to try them out? I've been curious about coq au vin (chicken in wine) since Casey made it on Top Chef several seasons ago. Recipes for this French dish keep popping up, and it has slowly made its way up my "to make" list, and finally reached the top. Perhaps it's because, as I mentioned before, this month's cookbook of the month ("How to Cook Everything") is a great guide for many classic dishes. Mark Bittman was once again my guide through this adventure. Cover dried porcinis with hot water, and set aside while you prepare the chicken. Heat 1 Tbsp oil in a large skillet over medium-high heat. Mix flour, salt, and pepper on a plate, dredge chicken in this mixture, and brown chicken in the oil (a few minutes per side). Remove the chicken and set aside. 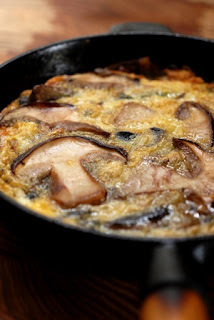 Reduce heat to medium, add remaining oil to skillet, and then add fresh mushrooms. Let them cook until they begin to get dark (about 5 min). While the fresh mushrooms are cooking, chop porcinis (but save their soaking water). Stir porcinis, 1/4 cup of their soaking water, onion, garlic, and thyme into skillet and cook about 5 min. Add tomatoes and cook another 5 min. Finally, stir in the rest of the mushroom soaking water, bay leaf, wine, and parsley. Place the chicken in this mixture, cover, and turn the heat down to medium-low. Let this simmer until chicken is done (about 25 min), turning chicken a few times. Serves 3. This was good, and I would definitely call it rustic (just as the Top Chef judges did). 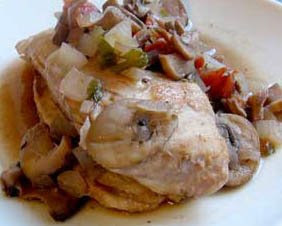 It reminded me a lot of chicken cacciatore, which isn't surprising given that that the chicken is browned and then braised with wine, tomatoes, and mushrooms in both dishes. The only big difference is with the herbs: chicken cacciatore uses many of the traditional Italian herbs, while coq au vin uses the French ones. I would leave out the dried mushrooms next time - they didn't add much, and there were already plenty of fresh mushrooms. I'm glad this finally reached the top of my list and I can say that I've experimented with another classic recipe. 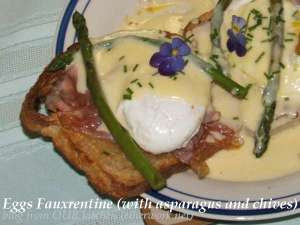 Weekend Herb Blogging solicited a number of fabulous posts this week, using a wide range of vegetables and herbs. This event was originally started by Kalyn of Kalyn's Kitchen, and is now organized by Haalo of Cook (almost) Anything At Least Once. For more information, see the rules, hosting schedule, and weekly recaps for WHB. Thanks to everyone who participated this week! 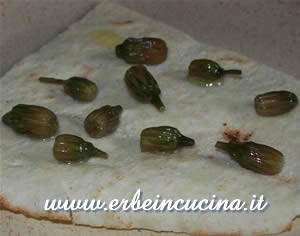 Next week's Weekend Herb Blogging will be hosted by Graziana from Erbe in Cucina. Send her your posts to her at scrivi AT ilmeglioincucina DOT it, and be sure to include a photo 300 px wide (for more info, see the rules). Over the past few months, I've received some feedback from several faithful readers that goes something like this: "I like most of your recipes... except the ones that use really weird ingredients." When I've inquired about these "weird ingredients," it turns out that they're usually referring to the whole grains that I use. Until about a year ago, I would have said the exact same thing, and until I was armed with a copy of Lorna Sass's "Whole Grains Every Day, Every Way", I didn't really know where to start. After I began exploring whole grains, I was fascinated by the diversity that exist and the great flavors that I had been missing out on. In fact, I went for about 5 months without eating pasta or rice because I had so many new things to try out. The best thing about whole grains? They're so much better for you. They include the bran and the germ of the grain, which hold most of the fiber, vitamins, minerals, and antioxidants, and about 25% of the protein. Because of the fiber and extra protein, they're extremely filling. Why leave all of this goodness behind? So, here's what's going to happen. Every few weeks (or whenever I get inspired), I'm going to write a post with general information about a specific whole grain. 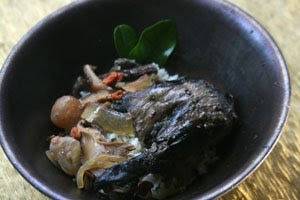 I will include information about the various types (if applicable), the way it tastes, where to buy it, how to cook it, and recipes that I've made with it. I may also include recipes from others (either ones that look great that I haven't yet tried, or ones that you guys send me). There are a few important things about all whole grains. The first is that they should ideally be stored in the refrigerator or freezer because the germ contains oils that can go rancid at room temp. Here's a secret: I don't have room in my refrigerator or freezer, so I don't do this (shhh... don't tell anyone!). The one exception is my whole grain flours, which I always store in the refrigerator. Instead, I buy small amounts of grains from the bulk bins at the local co-op or natural foods store and try to use them fairly quickly. Grains are also much cheaper in the bulk bins, so there's really no downside. I also make sure that they're stored in air-tight containers. So far I haven't had a problem, even after letting grains sit around for about 6 months. If you have room, go ahead and throw them in the fridge - it can't hurt, after all. Sorting and rinsing is another topic that applies to all whole grains. Always, always, always sort through your grains to pick out any rocks or debris. The one time you don't do this, you will crunch through a rock in your barley and think that you've chipped off part of your tooth. Then rinse your grains before cooking them. The downside of whole grains is that many of them take a long time to cook. But, you can cook up a ton of them and store them for quite a while in the freezer. I always make extra grains, particularly when I'm cooking one of the ones that has a very long cooking time, such as rice. Then I stick them in the refrigerator the day before I plan to use them or defrost them in the microwave (or, in some cases, they can be used frozen). 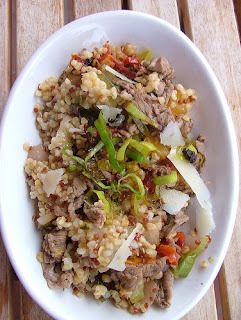 If you're short on time, there are several that cook quickly (quinoa and millet are my favorites when I'm in a hurry). Feel free to substitute one grain for another - it works in just about every recipe and you might find a new favorite flavor combo. The list below includes the grains that I hope to cover. I started this list before I eliminated gluten from my diet, so you'll notice a post on wheat berries. Obviously these are not gluten free. Also, several common grains are missing, like buckwheat. I tried it several times, and it's just not my thing. Sorghum and job's tears may be eventually included if I run across some or get around to ordering them, but I won't make any promises. You'll be able to find this post and all added gluten-free grain information on the right sidebar for future reference. Have fun experimenting! This is another recipe from "Peter Reinhart's Whole Grain Breads" and, like the Power Bread that I recently made, it uses the delayed fermentation method to create great flavor. If you were intimidated by the Power Bread recipe (and I'll admit that I fit into this category for a few months), then this may be your starting point. It's much easier and takes a lot less time. Again, I measured my ingredients by weight, but I'll also list the approximate volumes. Combine all of the ingredients in a bowl and stir until it forms a ball of dough and everything is well mixed (about a minute). Cover and let sit at room temp for 12-24 hours (or put it in the refrigerator for up to 3 days, but let it sit at room temp for about 2 hours before using it). Dust your work surface with extra flour, and knead the dough on this surface for about a minute. Add more flour if your dough is sticky (you want it to be barely tacky). Make a ball out of the dough and let it rest for 5 min. While it's resting, line a baking sheet with parchment paper and lightly dust it with extra flour. Knead the dough for another minute, adjust water or flour if needed (so that it's tacky, not sticky), and see if it passes the windowpane test (you should be able to stretch a small piece of it into a thin membrane without it breaking). If it fails the test, keep kneading until it passes. Then divide the dough into 4 pieces, form each into a ball, and place them on your baking sheet. Loosely cover them with plastic wrap or a towel, and let them sit for at least 20 min. Roll the balls out on your work surface until they're about 1/4" thick. Let them sit for about 5 min, then stretch each one until it's about 1/8" thick (about 10" in diameter). Heat a skillet over medium-high and lightly spray it with oil. Cook each piece of dough (one at a time) until it's brown on both sides (about 2 min per side). Makes 4 large pieces. When I make Indian food at home, I usually serve it with rice because I never think to make bread. I have a feeling that this is going to change. I ate this with my saag tofu, and it was fabulous (and did a good job at cutting the heat from the peppers). I love that you can really taste the wheat flavor because there's not a whole lot to this bread. At the last minute, I was able to practice some self restraint and kept myself from eating all four pieces. I'm still not sure how I managed that one. The best part of all: it was incredibly easy to make. A couple of weeks ago, I read about Coconut & Lime's five year anniversary. Coconut & Lime is unique among food blogs because all of the recipes are original, and I have quite a few of them bookmarked to try. 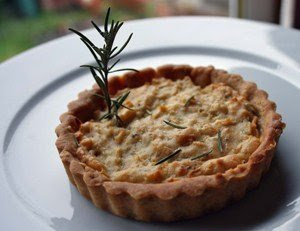 To celebrate the blog's anniversary, Rachel is holding a contest that requires readers to try out one of her recipes and write about it. This was the perfect excuse to give one of them a try. I chose her saag paneer recipe because it sounded delicious, and I was in the mood to try out more Indian cooking. Unfortunately this did not go as planned (but definitely not because of Rachel's recipe). I set out to use her paneer recipe, and somehow I failed miserably. Paneer is a cheese commonly used in Indian cooking, and is very similar to ricotta (but it's pressed to remove even more whey and then cut in cubes). I have successfully made ricotta several times (for lasagna and gnocchi), so I figured that it wouldn't be a problem. I heated my milk, added some lemon juice, and then let it sit to form curds. Then I made my first mistake: I didn't actually check to see if the curds had formed before I started pouring it into my colander. And, to make matters worse, I poured rather quickly and couldn't stop when I realized that there were practically no curds. I was left with about 2 Tbsp of curds, which were delicious but wouldn't do for the recipe. Given my success in the past, I'm not entirely sure what went wrong. I ended up using milk from another dairy - Moo-ville Dairy instead of Calder Dairy - but that shouldn't matter. Otherwise, I used the same method that I've used for ricotta in the past. Oh well, I decided to make do with a substitution that Rachel suggested: tofu. Heat 1 tsp of oil over medium heat in a large skillet. Saute tofu until cubes are brown on all sides, and then set tofu aside. Add another tsp of oil to the pan and saute onion, garlic, jalapeno, and ginger until they're soft (about 5 min). Add mustard seeds and cook another minute, or until seeds start popping. Stir in the remaining spices, spinach, water, and lemon juice, cover, and let simmer on medium-low for 20 min. Add the yogurt and tofu and let cook another minute or so, until tofu reheats. Serves 4. This was really good, and I'm glad that I didn't let the paneer snafu stop me. 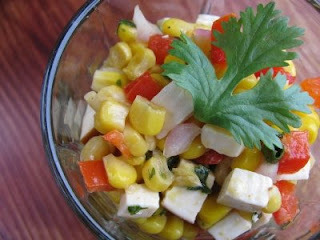 In fact, I really liked the tofu in it (it made for a lighter dish). I've made fairly decent Indian food before, but this probably came closest to what you would find at an authentic Indian restaurant. It definitely had the heat of Indian food! I like spicy food, and this was almost too hot for me, which is probably because the jalapenos I normally buy tend to be extremely hot. Next time I'll use less, use a milder pepper, or reduce the cayenne. I'm also glad that this recipe gave me a great excuse to finally buy asafoetida and amchur powder. These ingredients come up fairly often in recipes I read, but until now I've left them out or substituted for them (garlic, onion, or leeks can be substituted for asafoetida and tamarind concentrate or lime/lemon juice can be substituted for amchur powder). Perhaps that's why this recipe tasted more authentic. Another advantage is that apparently asafoetida is good for your digestion and has also been used for contraception (although I have my doubts that it's effective). Now I'm much more prepared to conquer more Indian cooking!